After graduating from the Royal Veterinary College in 2007, Karen travelled to the Cook Islands in the south pacific to volunteer for a charity veterinary clinic for 4 months. 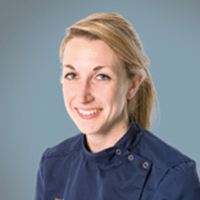 Upon returning to the UK, Karen worked in a busy small animal practice in Dorset for 18 months, after which she moved to SCVS to undertake an internship. This was followed by a 3-year surgical residency at Cambridge Veterinary School. Karen began working at SCVS again in 2014. She then passed her European Diploma in Small Animal Surgery in the beginning of 2015.